Newcastle, Hunter and Central Coast - Termite inspections and treatments. What is the cost of a termite treatment? I've found termites! How do I get rid of them? The natural tendency is to spray them with fly spray, why does every pest controller say not to? The answer lies in the way that termites behave, the termites in your home is just a small amount of termites that are part of a larger family. There may be a thousands of termites in your home, but the colony could easily be over a million strong! Killing the few in your walls won't get rid of the whole colony. That's why you need a specialist to carefully eradicate, not just a few termites but the whole nest! How do you eradicate a whole termite nest then? A variety of methods are used, depending on the type of termite and location of the nest. There's no silver bullet and it's not always a simple, quick process. We aim for 100% colony eradication. We inspect for termite nests during our termite inspections, if one is located then the most effective way of eliminating the termites is to eradicate the nest directly. This can be done in a variety of ways, either by physical destruction if possible, or by injecting a liquid, foam or dust termiticide that will ensure that the whole termite colony dies off. The method chosen to carry this out varies on size, location and species of termite. Each treatment is tailored to the nest. We're not kidding, this termite nest was eradicated! If a termite colony is eating a home and there is no sign of the colony, which is a common occurrence. Then often it's best to eradicate the colony by feeding the termites in the home a bait that they take back to the nest and effectively kills off the whole colony. 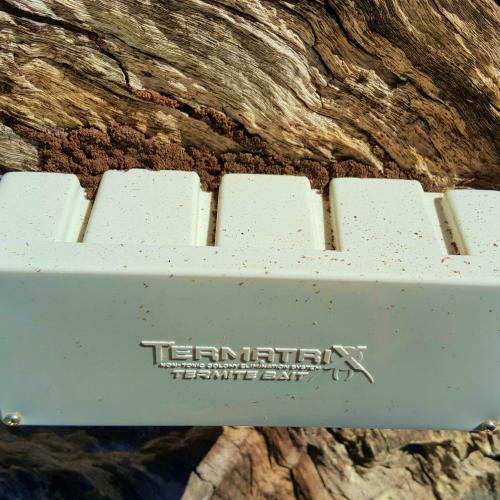 This takes care and time, it's imperative to feed the termites enough bait to ensure a complete colony elimination, whilst not disturbing them during the installation and re-baiting procedures. Through careful monitoring it is possible to determine the health of the colony and promote exclusive feeding on the bait rather than the structure that they originally infested. Termite bait on a tree where visible activity was minimal. The colony was effectively eliminated. A termite nest may be visible, but access to it may be limited due to height or other restrictions. Knowing the location of the nest is still a great asset as the health of the nest, or lack thereof, can be monitored remotely. In this instance we will use a method of eradication that will be most effective in eliminating the colony completely. The dead termites on this Sentricon Always Active rod demonstrate a remote colony collapse. If a sufficient number of termites are found inside a structure or other infested timber, it is possible to effectively kill the whole colony by introducing a foam or dust that will kill the whole colony remotely within a short period of time. The benefits of this method is a shorter time to effectively kill off the whole colony, as well as some very environmentally friendly options which only target termites and will not affect non target pests. Foaming a termite colony that had made it’s home in this wall. Altriset foam was used, which only targets termites and has extremely low toxicity. Will firewood bring termites to my home?